 Orimono (織物) refers to textiles or woven fabrics— a word often used when describing kimono wear and obi belts. 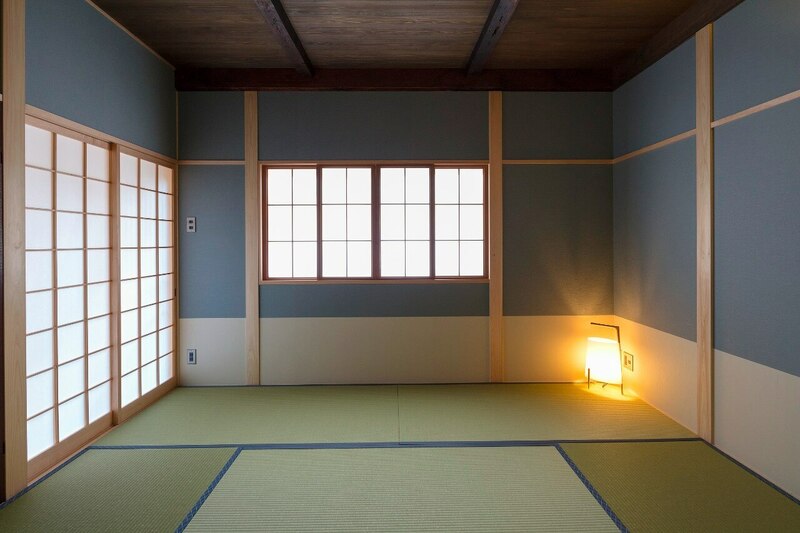 Requiring the skills and techniques of a team of craftsmen, and made on large traditional looms, this craft of textile arts has had a long held history in Kyoto. 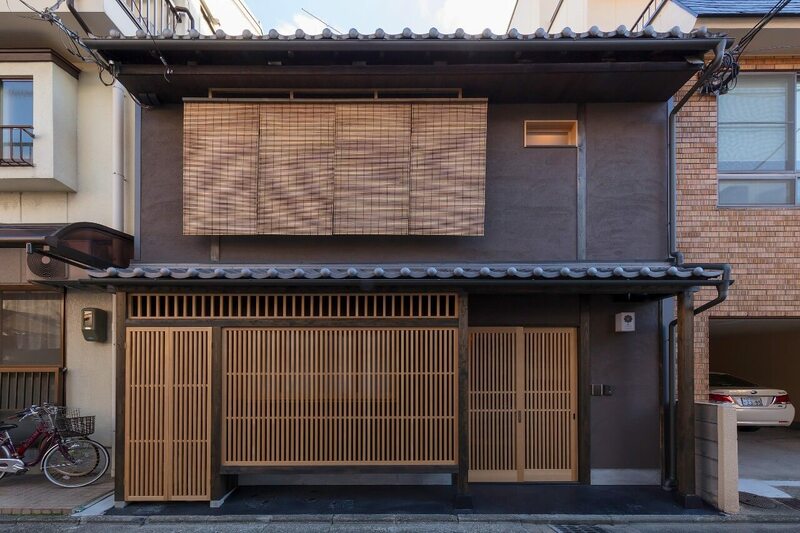 Kyoto boasts a textile district, known as Nishijin, where the intricately designed obi sashes, and kimono fabrics are hand-woven with incredible detail. 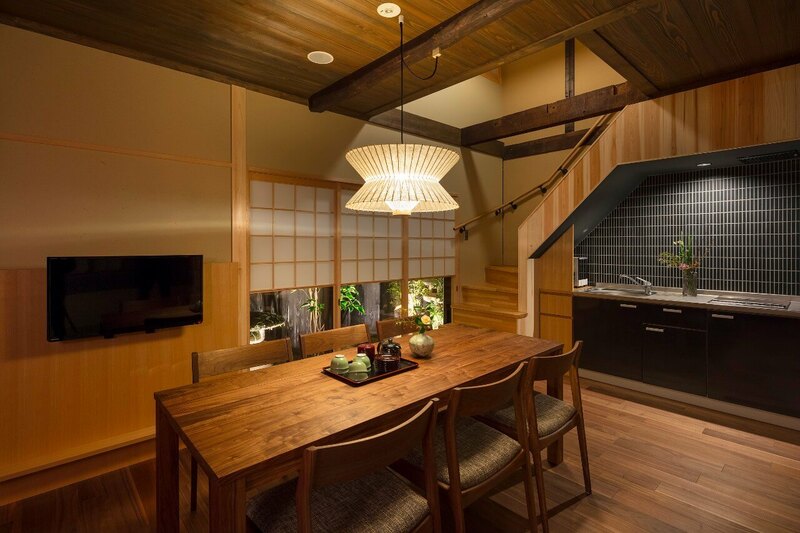 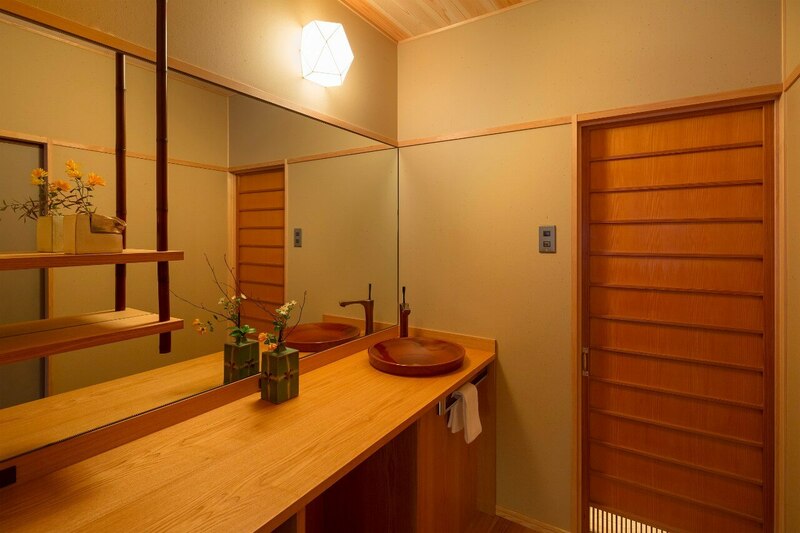 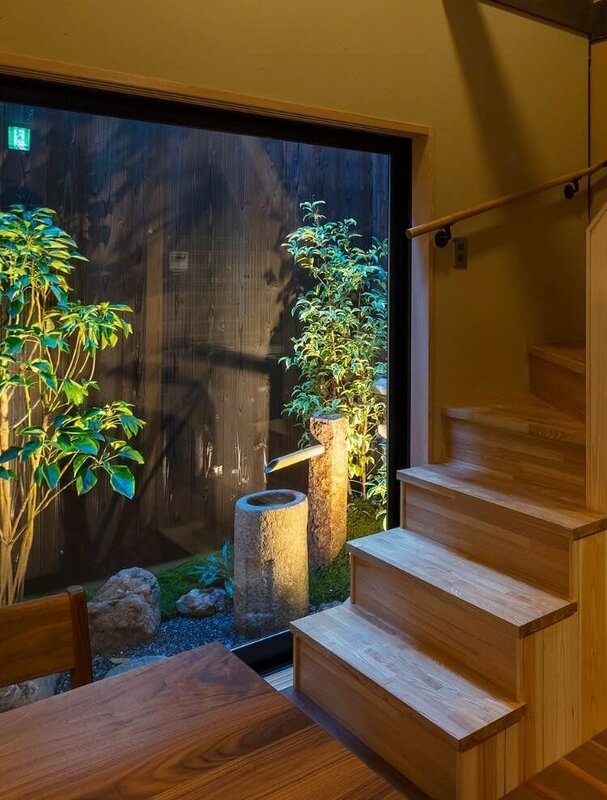 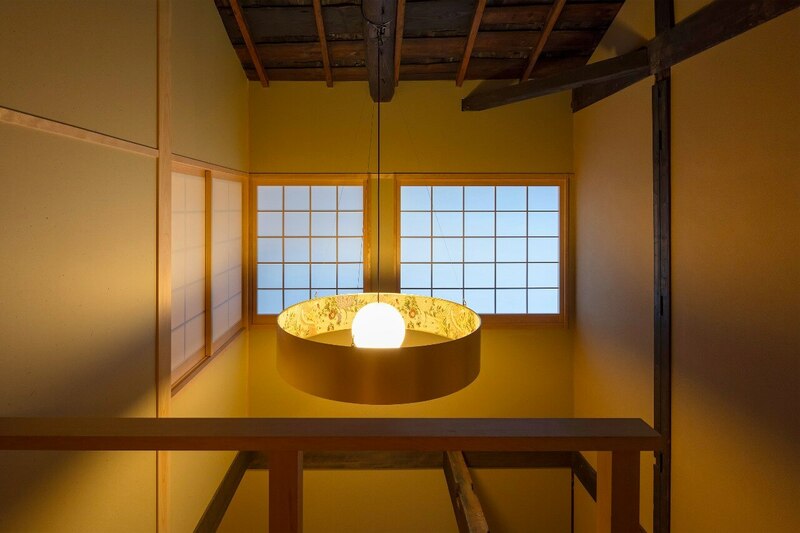 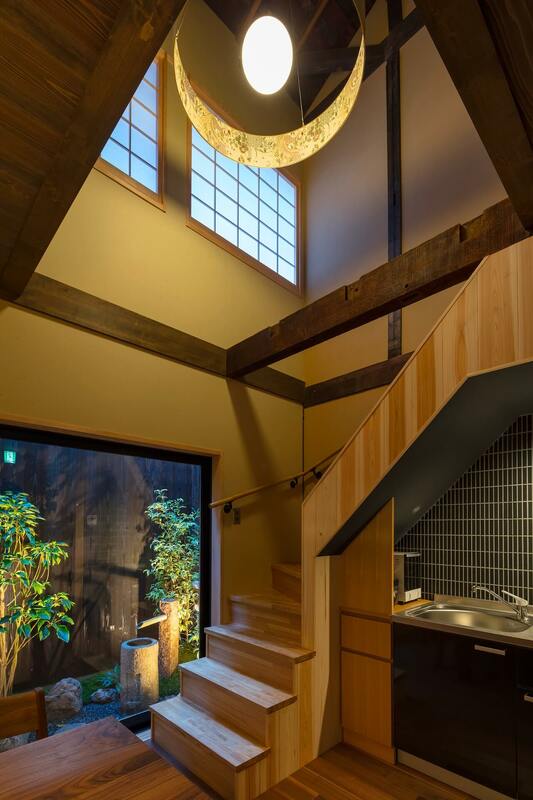 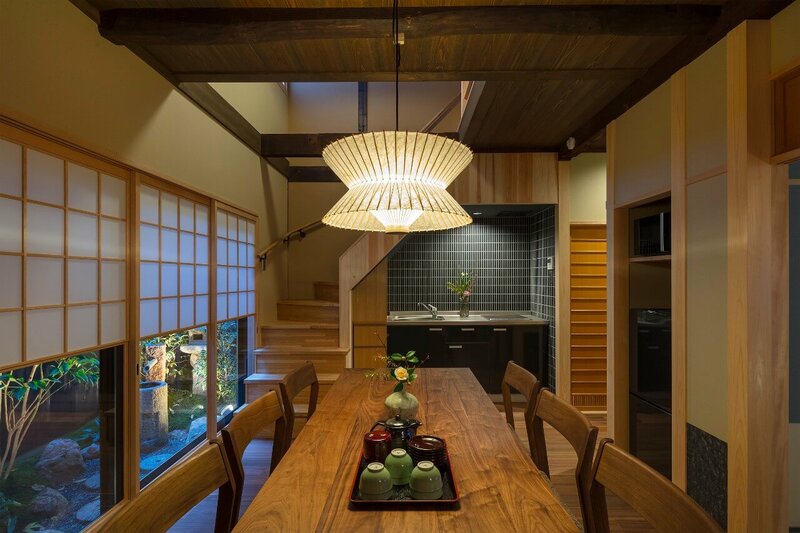 Ayaginu machiya house celebrates the history and craft of the orimono by incorporating these designs within its light fixtures, zabuton cushions, and more. 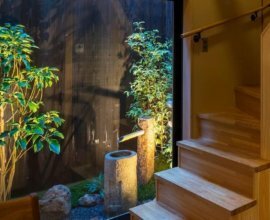 Delicate paper lanterns illuminate the tatami-lined rooms, kimono fabric line the inside of a lighting fixture above the stairs, and bright greenery that change color with every season within the tsubinowa garden. 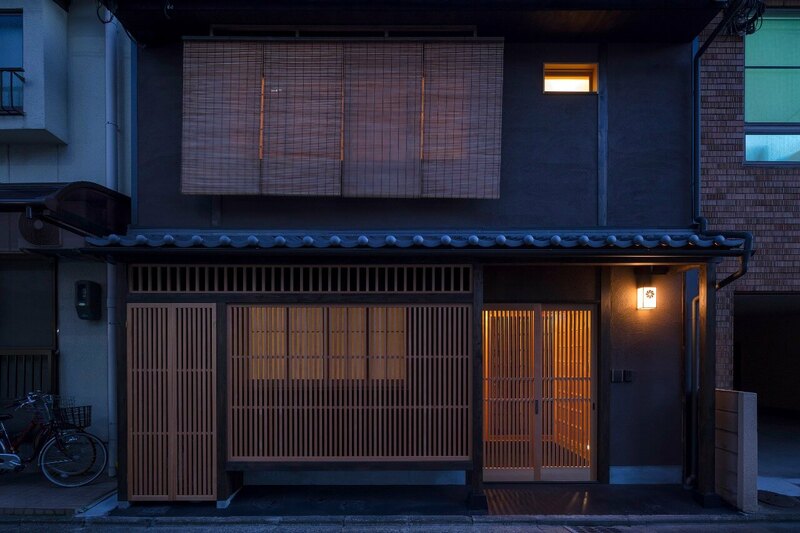 Kyo-Machiya House With wooden lattice doors and windows on the 1st floor and 'sudare' bamboo blinds on the 2nd, "Ayaginu" is an undeniably classic Kyoto machiya house. 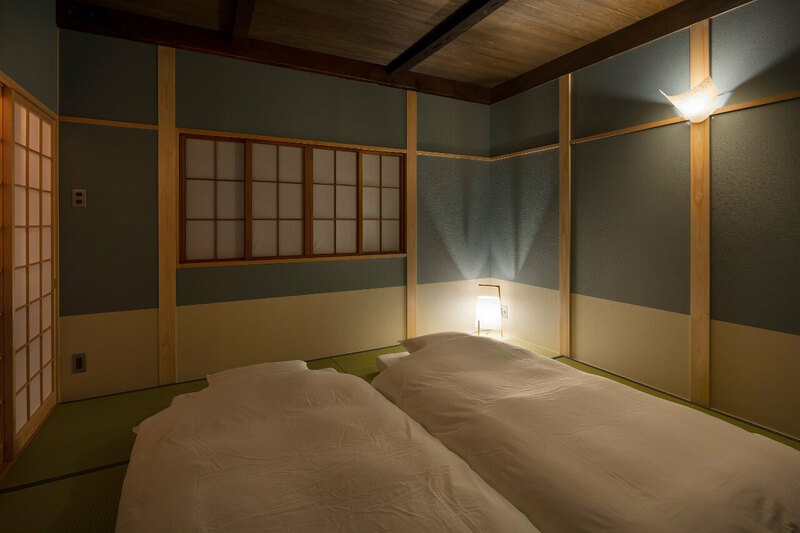 Brilliant Kimono Textiles From the golden custom-made art, to the fabrics of the couch and cushions, materials and patterns used in kimonos are found in the living and dining room. 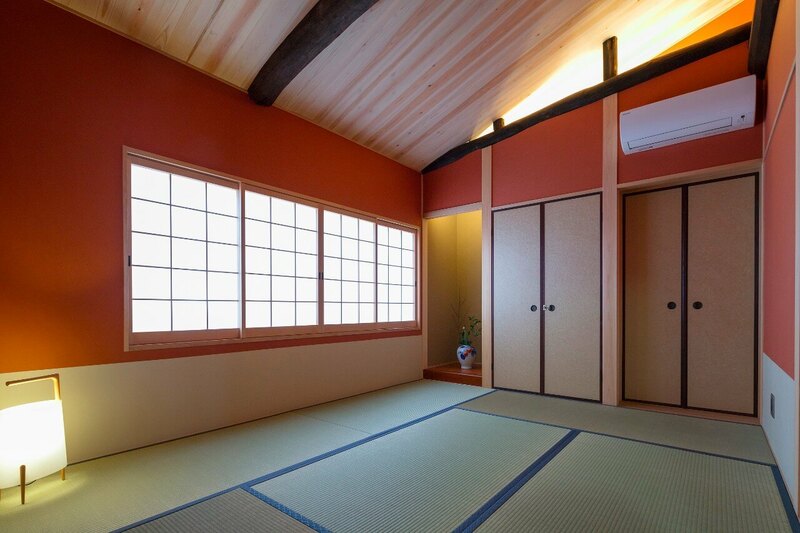 Gather in this gorgeous room. 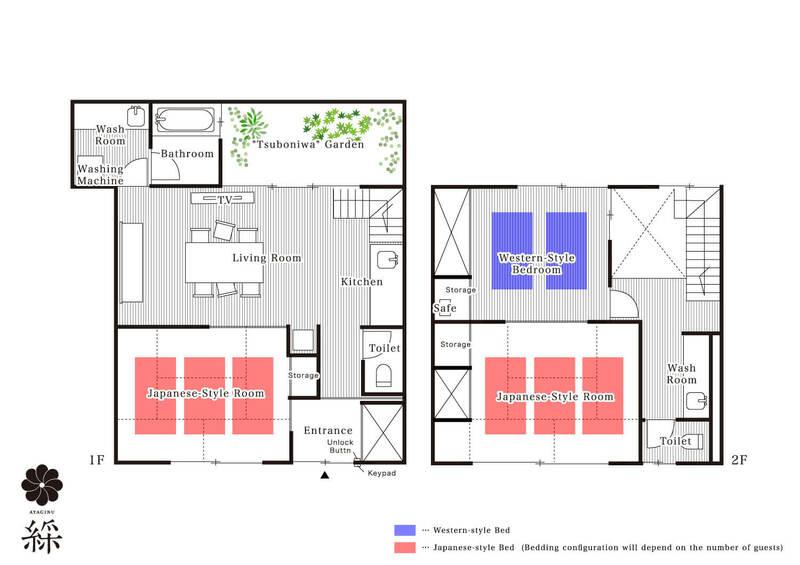 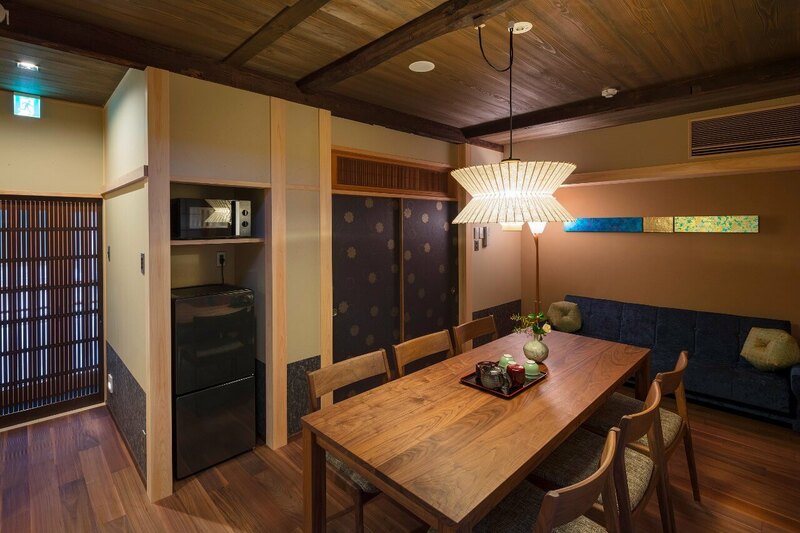 Fully Equipped Kitchen Just adjacent to the dining and living room is the kitchen. 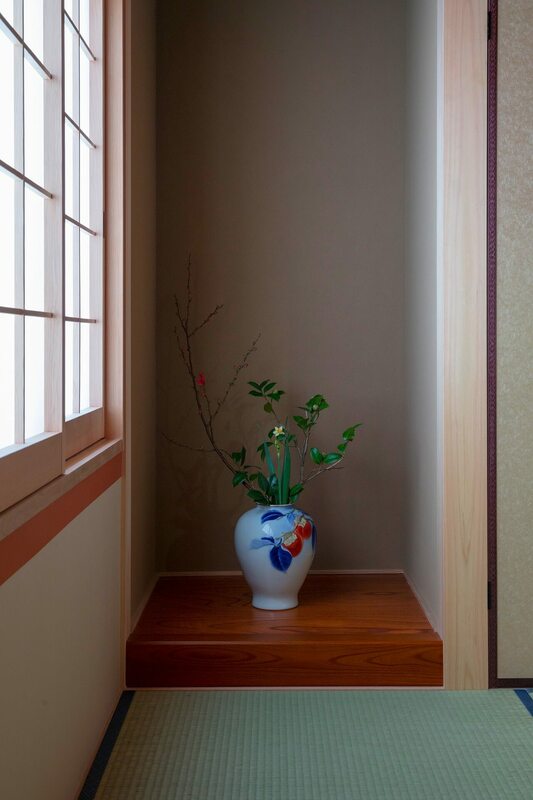 Enjoy the colours of the inner garden and look up to the light fixture lined with kimono fabric. 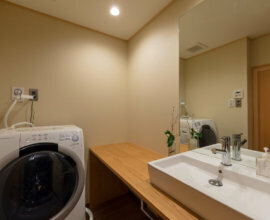 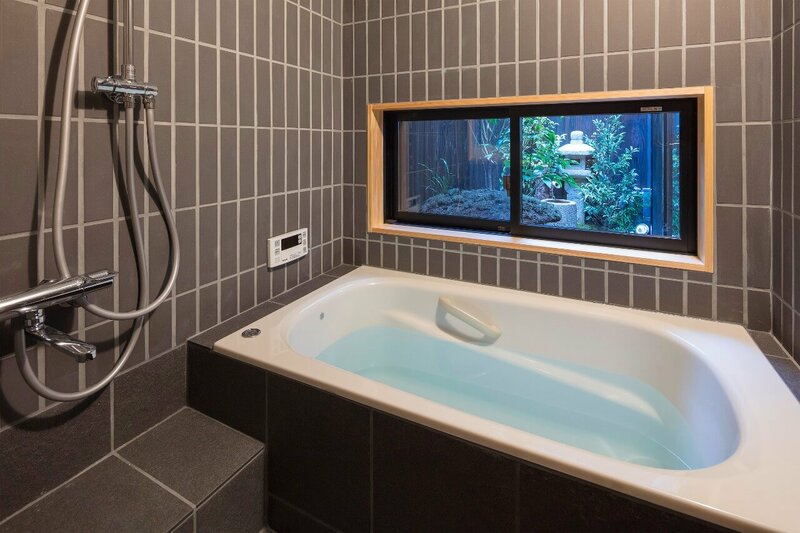 Bathroom Unwind with a view of the private garden. 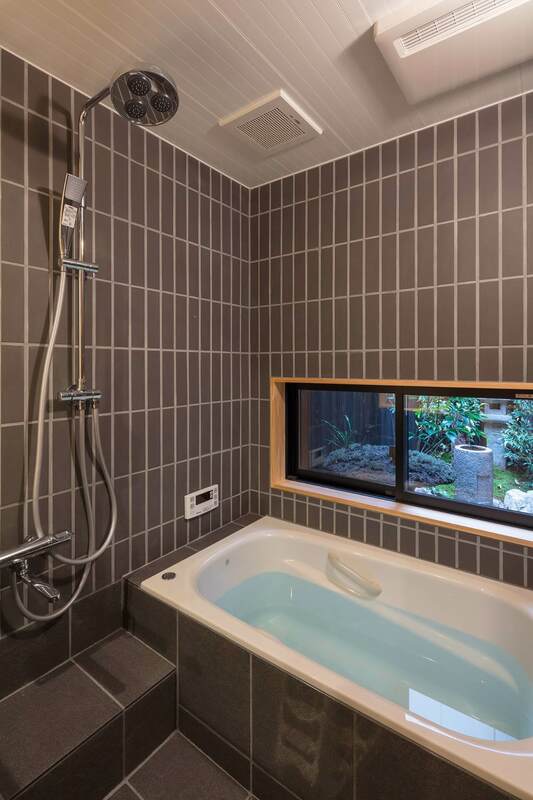 The rainfall shower, bathtub and curated bath amenities in delicious scents are perfect for relaxation. 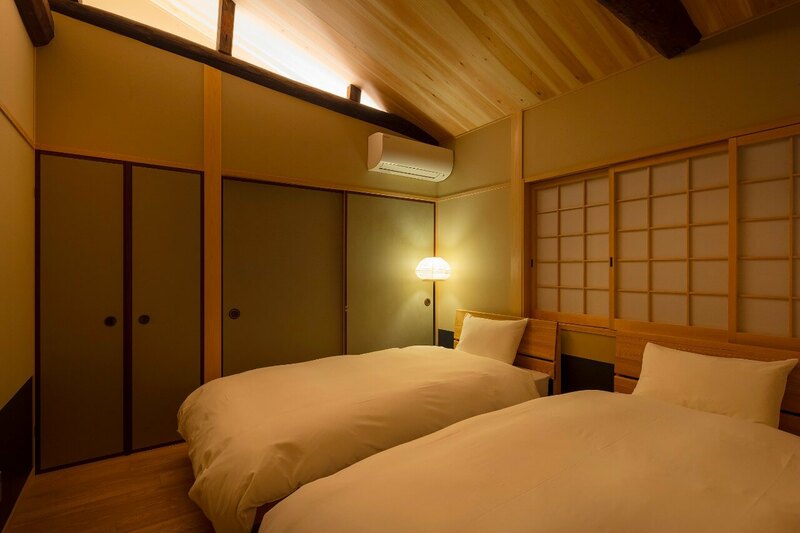 Western-Style Bedroom Warm lighting illuminates the textures and colours of the woodwork. 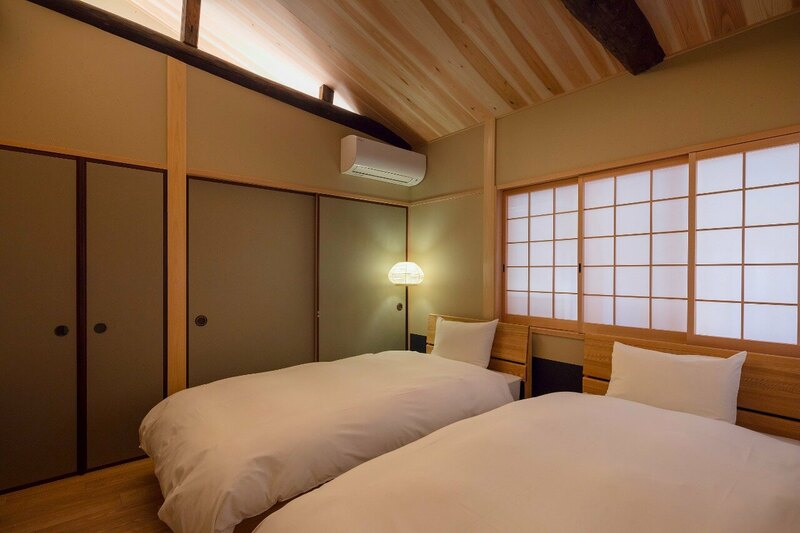 The bed frame is made from 'Tamo', a Japanese wood used in the past only by Japanese royalty. 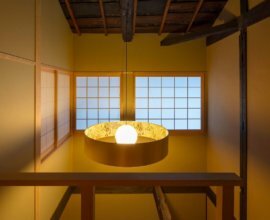 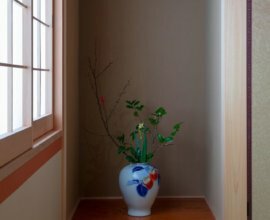 Two Japanese-Style Bedrooms The doors and windows covered by shoji paper and Japanese lanterns illuminate the rooms with soft light, creating a warm atmosphere. 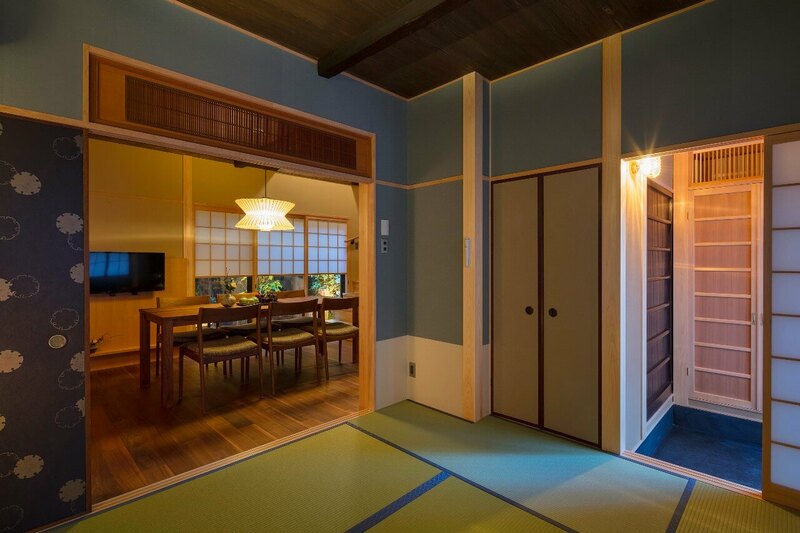 Incorporating the vibrant colors and exquisite textures of textiles throughout this traditional house, this private retreat will impress with its understated elegance. 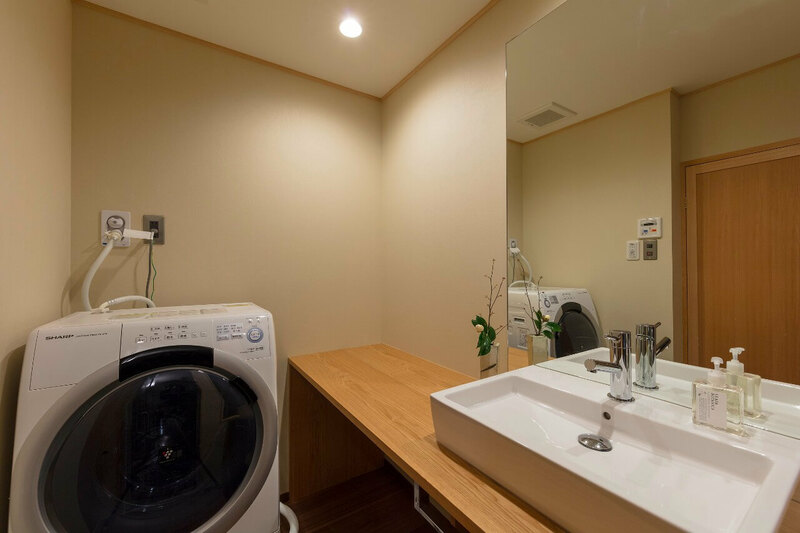 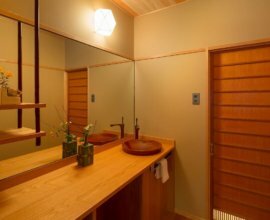 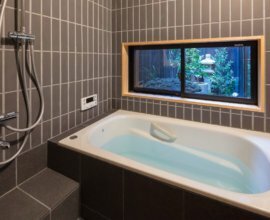 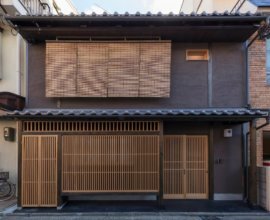 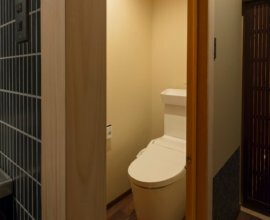 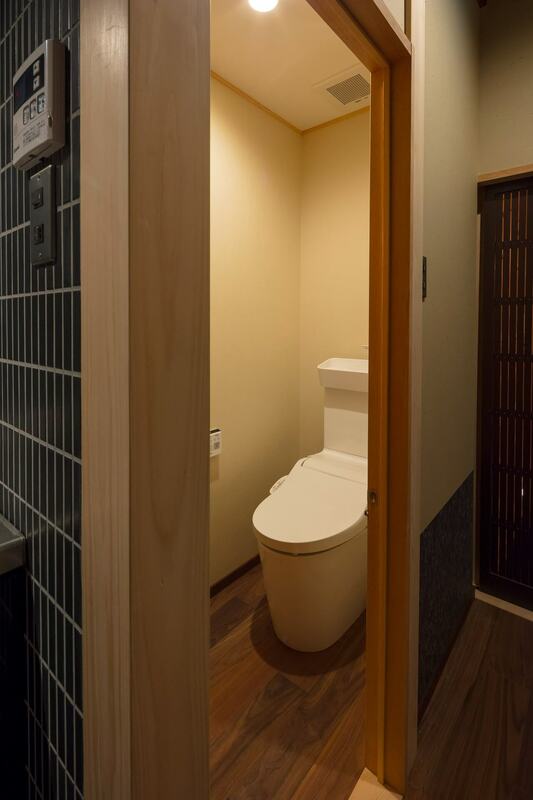 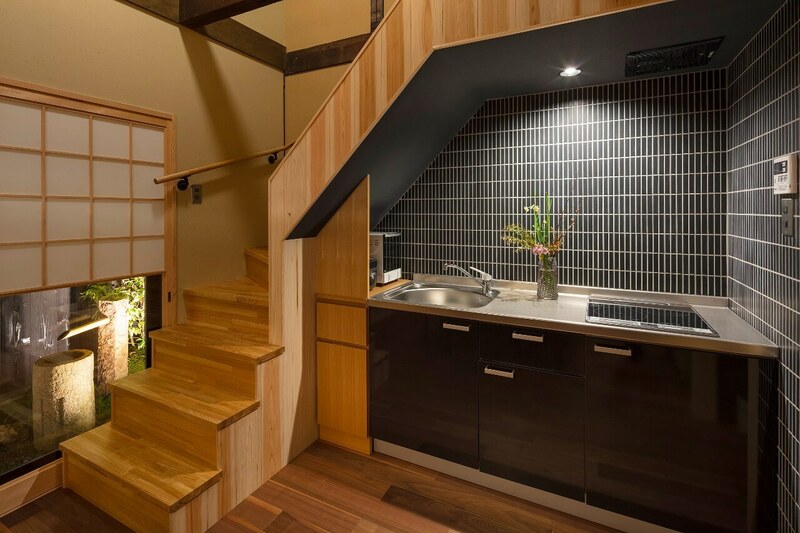 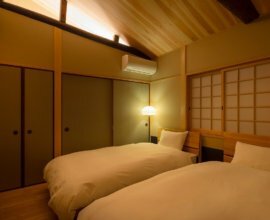 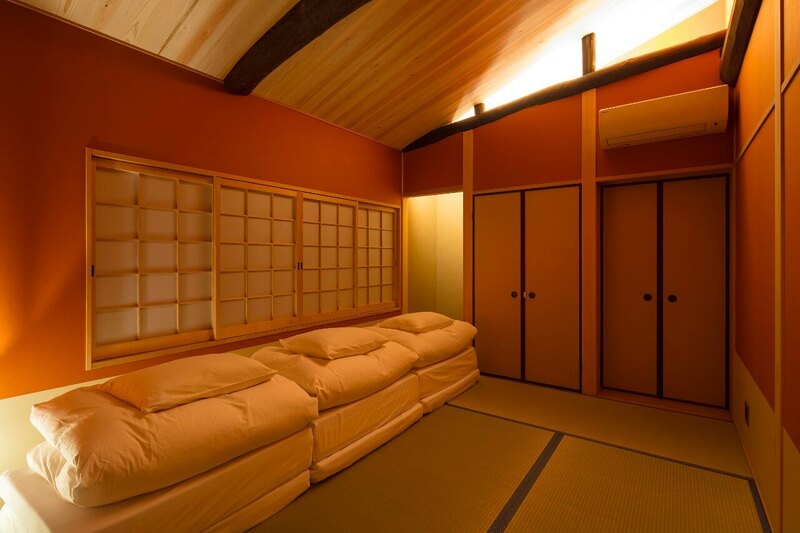 Within walking distance of Kyoto Station, this ideally located traditional machiya house will become your private home away from home. 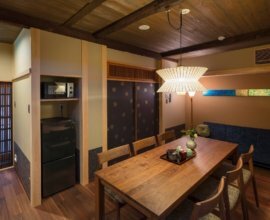 Each room of Ayaginu has been meticulously designed — from the lighting fixtures, textures of the walls, to the wall art, and more. 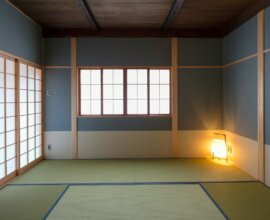 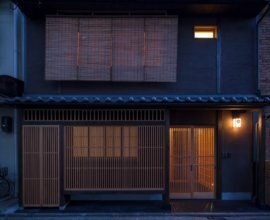 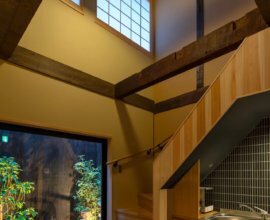 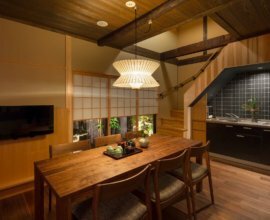 You will be able to truly appreciate the architecture and craftsmanship of this historical house during your stay in Kyoto. 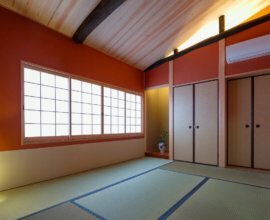 Walk to Shosei-en Garden in the afternoon, and marvel at the beauty that is the UNESCO World Heritage site Nishihongan-ji Temple. 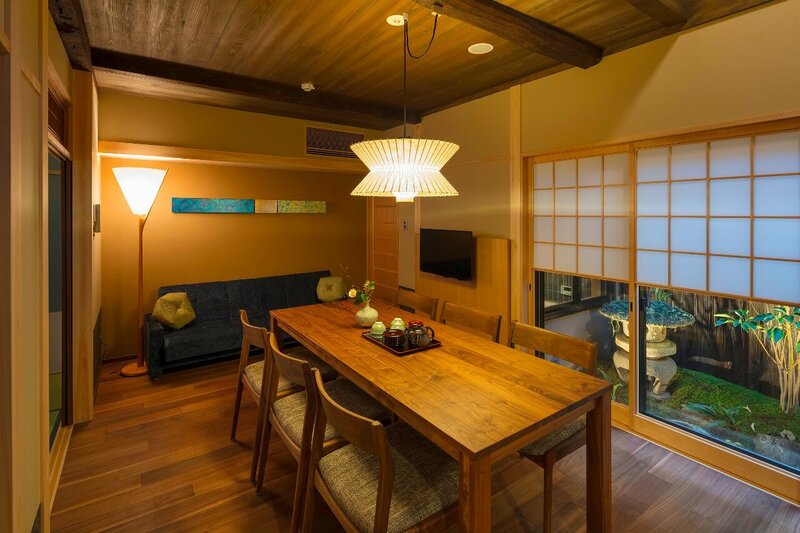 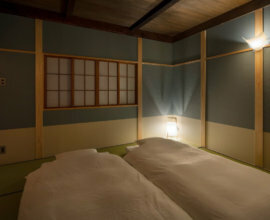 In the evening, have a relaxing dinner at a traditional Japanese Kaiseki restaurant. 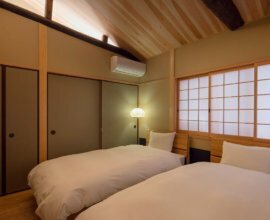 For longer stays in Kyoto, we recommend heading south of Kyoto Station to Uji City, or traveling north towards Kurama to explore the mountain side. 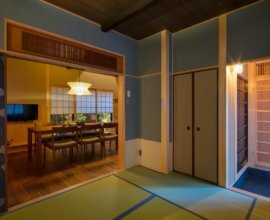 Because of its close location to Kyoto Station, you'll be able to explore every inch of this unique country.